Wow! Two Yarn Along posts in the last two weeks. I can't remember when I last managed that. 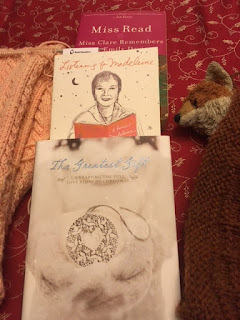 The Yarn Along is the wonderful weekly blog get-to-gether in which Ginny at Small Things invites us all to share photos of what we are knitting and what we are reading. I can't think of much that relaxes me more than stitching and reading and I love, so much, to see what everyone else is doing. In terms of knitting, I am having a hard time containing myself to a project long enough to finish. I set aside the fingerless gloves this past week and am continuing the cabled wrap for the DECE with whom I share a classroom. On Friday, I was playing a bit on Pinterest and suddenly, I was overcome with the need to do some special knitting for my kids for Christmas. I can't remember how the idea began but before I knew it, I had decided that LB needed a blanket for Foxy and Pk either needed hats for her Maplelea Dolls (similar to American Girl) or a blanket for Rabbity. My kids are both huge stuffy kids and it's quite touching to see LB who is now a six year old boy and pretending to be ten years old much of the time, devoting such love and care to Foxy. Foxy has a den made by LB, he participates in endless games and he is cuddled just about to death. He gets tucked in each and every night but there has been some upset as to which blanket actually belongs to him. I was volunteering at the local skating competition on Saturday for 8 hours and my time involved a lot of sitting around. It was exciting to see the blanket working up so quickly! In terms of books, I don't know that I have anything in the way of paper books that I wasn't reading last week. I am meandering though several books at the moment and I keep moving back and forth, which means that I am not reading anything quickly. I am LOVING Listening for Madeleine (interviews with people who knew Madeleine L'Engle in various ways throughout her life about their impressions of her - I am so relieved, I adore her writing and I am thrilled to learn that she is exactly the gracious, faithful and brilliant woman that I believed her to be). I am enjoying Miss Read's Emily Davis (exactly the kind of cozy for this time of year) and I am also revisiting Ann Voskamp's The Greatest Gift as my Advent reflection book. I really can't move away from books without a note about audiobooks. I somehow ended up with an Audible account that I was paying into monthly (don't ask) and I decided to give audiobooks a try. I walk a LOT and I love to have sometime that I can listen to. I am in love! I have enjoyed several books and right now, I am totally hooked by My Brilliant Friend by Elena Ferrante. I love the podcast What Should I Read Next (each new episode arrives in my podcast app on Tuesday morning and I can't wait for my Tuesday walk to listen!) She kept discussing these set of four books and I decided to give them a try. I don't know whether I would enjoy them as much if there wasn't a wonderful reader who is able to give an extra depth to the text and it would be hard to explain the plot in a way that would grab one the way that they have grabbed me. I have 3 hours left and I suspect that I will have to buy the second book as soon as I finish the first! Do you listen to audiobooks? Do you have any suggestions for me?